Mass Planting – For the look of Holland, it is best to plant bulbs en masse. Whether you’re planting six or six dozen, they make the best display when planted together in loose, informal clusters. By planting bulbs of one variety or colour in mass you will achieve greater visual impact by providing uniform colour and texture. Bulbs will be easier to care for since they will have the same cultural requirements and the foliage will mature at the same time. You should avoid planting in a single straight row or in a single circle around a tree or bush. Bulbs look better when they are planted in staggered free-form arrangements. Grouping Bulbs - With spring-flowering bulbs such as tulips or daffodils, plant at least 12 bulbs of one variety in a grouping. 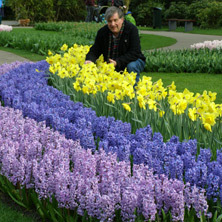 The more bulbs planted of one variety and colour, the greater the impact. Smaller spring bulbs such as snow crocus should be planted in groups of 50 or more to have impact. Smaller bulbs need to be viewed close up, so they should be planted along sidewalks, patios or entryways to the home. Three to six bulbs are suggested as a minimum number of summer bulbs of the same variety to plant in a grouping. Planting in Small Spaces - Plant bulbs of one colour in small spaces in the landscape. One colour will have greater impact and make the planting space look larger. Mixed colours planted in a small space tend to make the space look even smaller. Planting in Large Spaces - In large areas of the landscape where you have a lot of planting space, a planting of two or three different colours can be effective. Concentrate the bulbs for each colour together and do not intermix them. Also, be sure to select colours that blend together. White flowers can be effective in helping blend colours together or to brighten dark comers. Inter-Mixing Plants - The colour of spring flowering bulbs is enhanced when they are planted with pansies or other compatible early flowers. The colour of summer flowering bulbs will be enhanced when planted with summer flowering annuals such as petunias, marigolds and other annuals. Although summer annuals do not hide the dying bulb foliage, they do extend the colour of the flower bed throughout the summer. Many summer bulbs are tall and the lower part of the plant unattractive after bloom. Plants like lilies and dahlias can be mixed with perennials, annuals or shrubs to hide the lower stem area. Daylilies are a good choice to hide the lower stems of the lily. The dwarf forms of daylilies like Stella de Oro do an excellent job of facing a bed. Lasagna Planting -Just like making lasagna, layering bulbs isn’t difficult—it just takes a bit of planning. When selecting your bulbs, consider bloom times, color, height and texture. 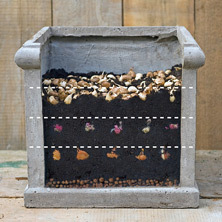 If layering in a container, select a large pot that has drainage holes, or place a few centimetres of pebbles in the bottom for drainage, and lay a base of potting soil about 10 cm deep into the pot. Set in one layer of bulbs using your largest variety. (For instance, tulips and daffodils are large bulbs, while crocus or muscari are smaller.) Pack the bulbs fairly close together; they can be nearly touching. Add in another 5 cm of soil, then the next set of bulbs. Repeat with a third layer. Fill the pot to the top with potting soil and water well. You can keep the pot in your garage or an outbuilding until early spring, when you’ll want to sit it in the sun and wait for your flowers to spring up! The lasagna planting method can also be used directly in the garden. 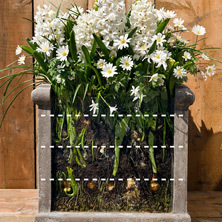 Just plant the largest bulbs at the depth recommended on their packaging and layer smaller bulbs on top. Lasagna planting allows for a variety of colors, sizes and textures in a single space. Create a rainbow in a container or plant several flowers with similar hues and varying bloom times for a compact, long-lasting garden display in your favorite colour.